Less than an hour after leaving the Boston Fish Pier for George’s Fishing Bank off Cape Cod, the crew of the 170-ton trawler Lynn sat down for an early evening dinner. It was just after 5:00 p.m. on November 29, 1951. Suddenly, the 10,500-ton tanker Ventura struck the Lynn from behind and plunged the fishing boat under its colossal flaring bow. The 13 men sitting at dinner didn’t have a chance, and perished as their trawler heeled over and sank. Thrown from the wheelhouse into the frigid waters were four members of the crew, including the helmsman, 46 year-old John J. King of Winthrop, and Lynn‘s captain, James C. McNamara, age 41, of Medford. All four were rescued by the fishing boat M. C. Ballard, which rushed them to the Boston fish pier to waiting ambulances. However, the other two, Mate Jim Hayes and crewman John Rogers who had come up to invite McNamara to join them for dinner, died on the way. The Ventura, having delivered its cargo of fuel at the Union Oil dock in Chelsea, had just passed the Ballard at a speed of 13 to 14 knots. At the scene of the accident, the tanker reversed its engines, radioed for help and stood by to render assistance. “More than 12 Coast Guard, harbor police and private boats searched the dark water for possible survivors as a Coast Guard plane dropped flares to provide illumination,” United Press reported. Why the Ventura struck the Lynn in Broad Channel is unclear. The sun had just set behind Boston, leaving calm seas. “The Coast Guard said the weather was clear at the time of the accident which occurred between Graves Head and Finn’s Ledge about 5:15 p.m.,” according to United Press. Lynn‘s running and deck lights were properly operating, and Ventura‘s skipper and crew had each other’s vessels in sight. The tanker even whistled and rang bells to tell Lynn that it was overtaking the trawler, but the fishing crew couldn’t hear. Then Ventura struck a rear davit on the smaller boat, causing the wreck. A legal case later established the circumstances in a detailed report. The 102-foot Lynn was a Boston boat; the Ventura, a T-2 tanker (hull # 73) built for World War II service at 504 feet in length, was registered in Wilmington, Delaware, and owned by the Ventura Steamship Corp., apparently a subsidiary of The Texas Company (Texaco). The collision occurred not far from where, just a decade before, 18 fishermen drowned aboard the Mary E. O’Hara in Boston Harbor’s worst maritime disaster. Though an admiralty court found Ventura solely responsible for the disaster, Texaco appealed the case, which dragged on for years. After Texaco lost its legal appeals in 1955, the Ventura was renamed Tuscarora with ownership transferred to another apparent shell company called the Tuscarora Corp., and re-flagged in Monrovia, Liberia, West Africa. It was renamed World Tempest in 1956. In 1965 it was sold to an Italian ship breaking company for scrap. Also see: Edward Rowe Snow, The Islands of Boston Harbor (revised edition, 1971), p. 198. 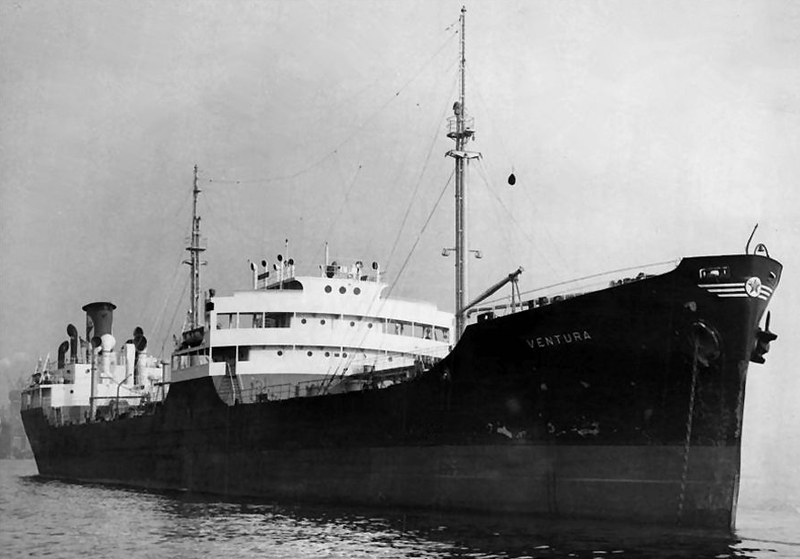 A T-2 tanker similar to the SS Ventura, which sunk the trawler Lynn off Graves Ledge in 1951, with a loss of 15 men. I am interested in this story as it as the John .J(likely James) King was at the helm. He is my 2nd cousin. He would have been my fathers 1st cousin. Their history is from Cape Breton ,Nova Scotia. I am also interested in the background of the Captain James McNamara as my grandmother was a McNamara also from C.B. My grandfather George Proctor was also on the boat. If there is something you want to know. They were all related on the ship- cousins.